Dissolve strawberry flavoured jelly crystals in 450 ml boiling water. Pour 2 to 3 tablespoons jelly mixture into each serving glass. Do same process with remaining glasses. Put these glasses in refrigerator till jelly set. Blend strawberry crush, coconut milk, and vanilla ice cream in a blender. Pour this mixture into glasses which we put in refrigerator earlier. Again put these serving glasses in refrigerator for 2 to 3 hour. 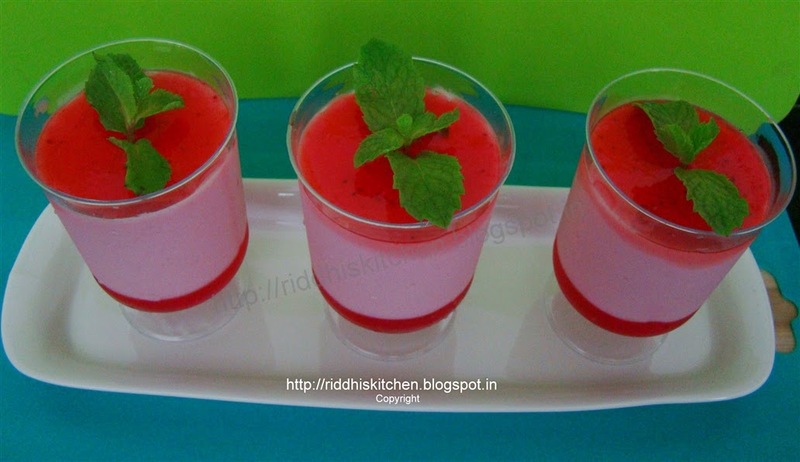 Pour 2 to 3 tablespoons strawberry crush and garnish with mint spring and serve chilled.